When I first started teaching over 20 years ago, the company I worked for was relatively new and didn’t have any resources to share with us. They gave us a binder full of pages (one for each day of the course we were supposed to teach). Each page had a different topic on the top of the page, the rest of the page was blank and we were expected to fill it in with our lesson plans. 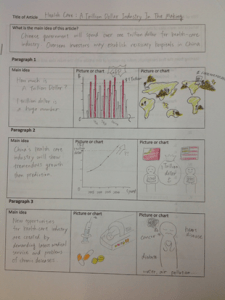 Any materials that our lessons required were up to us to prepare. Now this was before laptops and the internet so none of us had brought our computers because they were so big and bulky. We were working with pens, rulers, scissors and glue. Needless to say, those first efforts did not look very professional but it did teach me that even with limited resources, it is possible to create course materials that are engaging and help students reach their goals. If you show me an example of how you want it done however, I have a much better chance of understanding what you want. If you create materials for your activities that show in their design what students are supposed to do with them, just hand out the materials and let them figure it out. If your materials need a bit more explanation, try filling it out yourself to show everyone what to do. 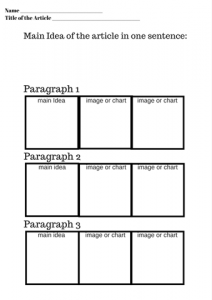 For example, if you are going to give students a graphic organizer like the one below, show them an example of what it should look like. Games There are a myriad of games that are ready made for teachers to grab and use but they won’t be focusing on exactly what you have been studying in your classes or on your unique group of students. I like to make card games using the vocabulary we are learning in class. Usually I used Canva to make cards but even just a simple table on Word works great. The cards I create can be used for warm up activities (give each student a card, have them think of a question using that word and then do a “mixer” style party in which students have to ask 2 or three other students their question). They can be used to play Memory, Go Fish, Dominoes and many other games. 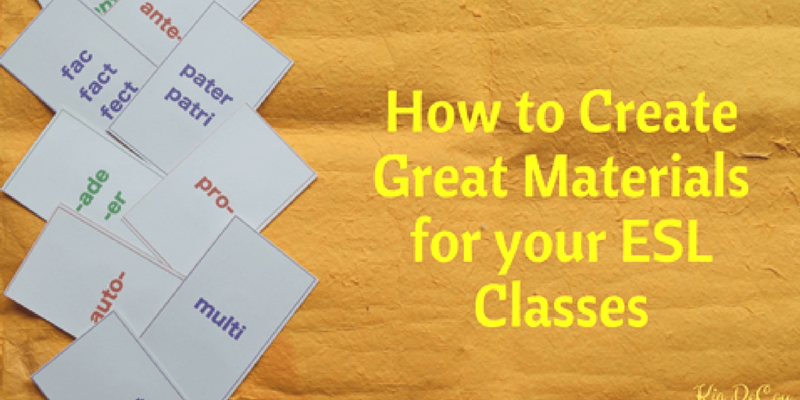 You could also make board games, puzzles or role-playing games for your students; just make sure that the games are designed around helping your students build and practice the skills that form the foundation of your curriculum. Songs I am not personally talented at singing or songwriting but I like to bring music into my classroom. One activity I like to do is find songs about the topic we are studying, print out the lyrics for several songs, cut them up, give one line to each student. The students must then find people who have lyrics to the same song and form groups. Then they have try to figure out the order of the lyrics before listening to the song to see if they were correct. When that is finished, they have to perform the lyrics in some way. They could either sing it, act it out, do a dramatic reading or something else they think of. 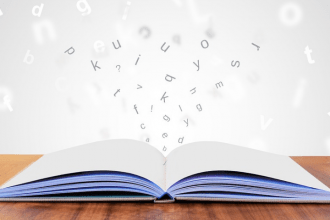 Sometimes it is difficult to find just the right passage on just the right subject at the right level for your students so, why not create your own. You could write passages about your own life; I have found that students love finding out more about who we teachers are outside of the classroom. You could write passages using your students’ names, that is always a hit! You could also take an existing passage and modify it to better fit your students’ levels. By sharing your own writing with your students, you are setting an example as a writer and showing them that it is not just something you ask them to do. You know exactly what your students have been practicing in your class so you are the best person to create tests for your students. Think about the goals of your class and plan your tests accordingly. If the goal of the class is to pass a multiple-choice test, your test should focus on the skills they will need to achieve that goal. If, on the other hand, your classes focus on essay writing, the test should require them to demonstrate that they know how to write. I have found that so often, a course focuses on one skill while the exam expects students to present their learning using a totally different skill. Try not to do that. People love to touch things and move them around. I remember one class I taught in Turkey in which I brought in homemade play dough. I was teaching university students and I can’t remember why I made play dough for them, but I had it all laid out on the table in the front of the class as the students were coming in. The first student looked at it, smiled and asked if she could borrow a chunk of it. I said sure, then the next student came in and did the same thing. Soon all of the dough was gone and the latecomers were begging their classmates for a piece. They just loved holding and shaping it. I love photography so I often bring my pictures to class with me. You could also take photographs of your class and bring them in for your students to use as writing or speaking prompts. Kia DeCou has had the good fortune to be an ESL/EFL teacher for more than 20 years. She studied at the School for International Training in Vermont and is from the United States but currently lives and works in Japan with her husband and daughter. Exploring the world and all of its ideas by reading books and developing her skills in photography in addition to physical travel, fills her life with surprises.